Earth Day is coming up next Monday, April 22, 2013. It's a day that reminds us of exactly how precious our Earth is. Get your students involved in the discussion, make them more aware and encourage them to help become part of the solution and not the problem. 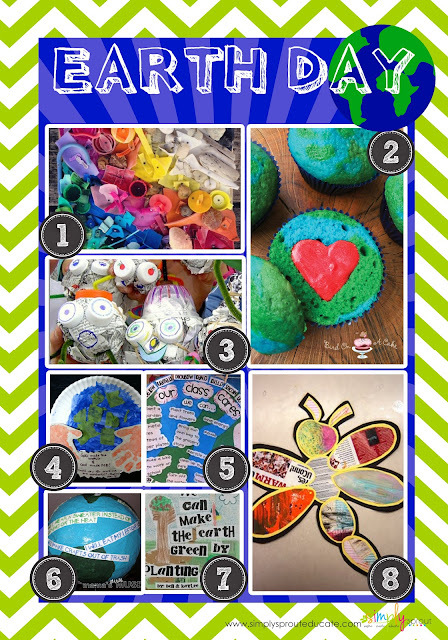 We have found some of our favorite Earth Day activities, we hope that you will check out a few and incorporate them into your classroom this year. 2. Earth Day Cupcakes Break out the green and blue food coloring for these yummy Earth day treats! 3. Liter Bugs Collect recyclable items and have students create their own litter bugs, practice those creative writing skills by having them write a descriptive paragraph or story about their new creation. 4. Have students create an image of the Earth using tissue paper or paint on to a paper plate. Have them place their hands in paint and place onto a piece of construction paper, cut out and glue at the bottom. On an index card have students write down a way that they can help protect the Earth. and glue it onto the bottom of their plate. 6. Paper Maiche Globes, Kids love Paper Maiche, what's not to love, it's a chance to get messy. Inflate a balloon, provide students with strips of newspaper and a mixture of glue water (75% glue 25% water) Apply moistened strips onto balloon till thoroughly covered. Once dry have students use paint to color or use tissue paper in the same fashion as the newspaper strips till covered. Once dry you can use strips of paper for students to write down ways we can help protect our environment, or ways we benefit from the Earth's resources. 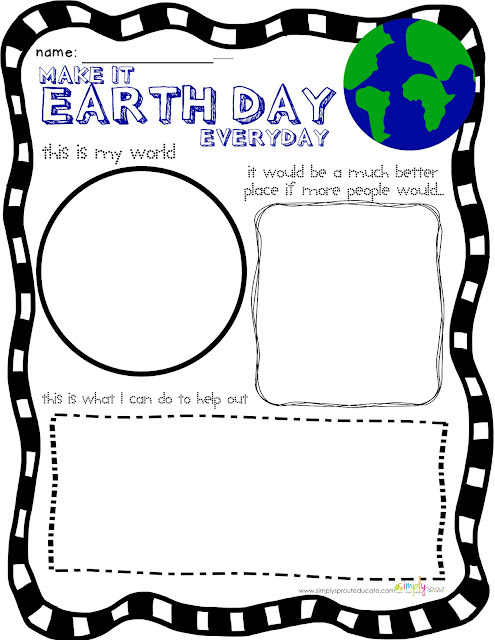 7.Earth Day Posters, Have students design posters to get the Earth Day message out. Use them to adorn the cafeteria or hallway at school. Extend the activity by having students write a commercial or radio ad to entice viewers at home to get off the couch and pitch in to make our Earth a better place. 8. Recycled Prints Have students create their own one of a kind art using recycled, boxes, newspapers, magazines etc. Make into shapes like flowers, trees, dragonflies and assemble together as a bulletin board. I hope that Earth Day will get your students engaged and will help them decide to take action. 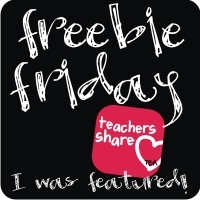 Get the discussion going with this FREEBIE below. Click on the image above to be taken to our store. How do your students celebrate Earth Day, leave us a comment below.